'til St. Patrick's Day. Erin go bragh! Fri, Oct. 19(A Little Passed) Half-Way to St. Patrick's Day March – Noon-4:00 p.m.
Thu, March 14Irish Channel block party - 1:00 p.m.
Fri, March 15Molly's at the Market Irish Parade - 6:00 p.m. Sat, March 16 Parasol's Block Party 10 a.m. - 8 p.m.
Irish Channel Parade - 1:00 p.m.
Sun, March 17 Downtown Irish Club Parade - 6:00 p.m. Sat, March 23Italian-American St.Joseph's Parade - 6 p.m.
Our annual St. Patrick's Day Parades are considered another opportunity for family and friends to get together and enjoy a day outdoors. It seems as if the entire city is on the street with picnic baskets, umbrellas, and their recreational vehicles...enjoying one of the biggest street parties of the year! Men and women in walking groups from various clubs in the city dress in costumes of green and give out flowers, beads, and kisses to lucky parade goers along the route. Music adds to the festivities with bands in the parade, and walking groups dancing down the street...only stopping to award their beautiful beads and flowers to the lucky parade goers along the route. Coming to New Orleans for St. Patrick's Day? Here's hotel information. Annual event hosted by The Irish Channel St. Patrick’s Day Parade Club. The fun will begin on the steps in front of Jackson Square near 768 Decatur St. and follow with parading throughout the French Quarter. This block party takes place on St. Patrick's Day and is located at Annunciation Square on the 1500 block of Chippewa. This block party has Irish music, food, drinks, and dancers, and proceeds benefit St. Michael's Special School. 3rd and Constance 10am to 8pm. Music, green beer, food and surprises. The start of the block parties on the day of the Irish Channel Parade. The fun runs from 10 am to 8 pm, both days. Annual celebration in the Irish Channel - 2604 Magazine Street. Lots of green beer, corned beef and cabbage and more fun. They are the party at the end of the Irish Channel Parade. 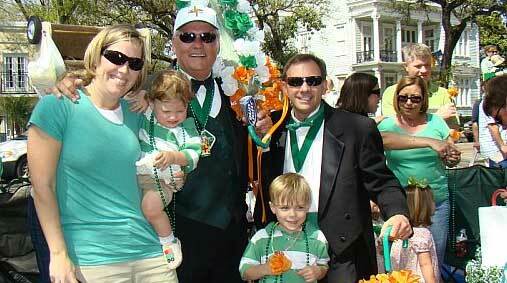 The Irish Channel Parade starts on Napoleon Ave & Tchoupitoulas at 1:30 p.m. The annual Metairie Road St. Patrick's Day parade will take place at noon in front of Rummel High School on Severn Avenue, goes down Severn to Metairie Road, then Metairie Road to the parish line. The annual downtown St. Patrick's Day parade begins on the corner of Burgundy and Piety in the Bywater, proceeds roughly up Royal, across Esplanade to Decatur, up Canal to Bourbon. The parade makes several "pit stops" on its way to Bourbon St. The St. Joseph's Society celebrates St. Joseph with a parade through the French Quarter. The parade kicks off at 6 p.m. at the intersection of Convention Center Blvd. and Girod Street. It includes 16 floats, nine marching bands and a whole lot of guys dressed in tuxedos. The Louisiana Irish-Italian Parade will roll at 12:00 noon, on the traditional Veternas Highway route in Metairie. The St. Bernard Irish Italian Islenos Community Parade is one of the largest events in nearby St. Bernard parish. The parade starts at 12noon along the W. Judge Perez route in Chalmette - from Meraux Dr. down to Ventura and back! It consists of 53+ floats, 35+marching groups 1,500+ members and 350,000 pounds of produce!